Last night we had a very powerful snow storm come in and drop about 4 inches of snow on the ground. Wind gusts are up in the 60 mph range and there are alot of snow drifts. We just spent the morning with the family plowing snow with the ATV and playing in the snow. The best part is coming back inside and warming up with some hot chocolate. Now it looks like we are ready for wave 2 as it is suppose to snow another 6 inches later today. I snapped a few photographs while we were outside. I love walking in the snow as there is a quite noise as you stroll down the path. Everything is silent and peaceful. If you have ever lived in the northern latitude, you will understand what I am describing. 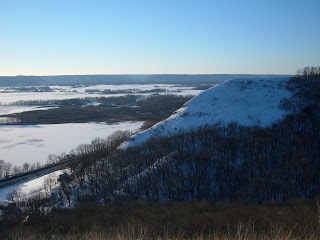 The next photo is overlooking the bluffs of the Mississippi River, where my inlaws have built a beautiful log home. They have the perfect view!